Property 16: Room for two families here and a short walk to the lake. Property 21: Right by the lake and boat ramp! Property 31: Getaway at the Lake - the perfect spot on the lake! Spacious, modern home in a prime location - Cross the street to the Lake! Property 32: Spacious, modern home in a prime location - Cross the street to the Lake! 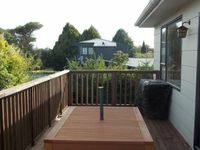 Property 50: Tui Appartment Taupo close to the great lake. Very practical housecto stsy in. Very warm and comfortable beds!! !